Khandwa, August 4, 2008. The prestigious Kishore Kumar Award for the year 2008 was conferred upon actor, Manoj Kumar. The award was received by the veteran in Khandwa on the occasion of the 79th Birth Anniversary of Kishore Kumar on 4th August, in Khandwa. The award instituted by the state government’s cultural department in 1997 carries a cash prize of Rs one lakh and a citation. This entry was posted on Tuesday, August 5th, 2008 at 7:18 pm	and is filed under Trivia. You can follow any responses to this entry through the RSS 2.0 feed. You can skip to the end and leave a response. Pinging is currently not allowed. kishore da is one of the greatest singers the world has seen. I M FROM PUNJAB AND HERE WE ALL KISHORE DA FANS GATHERED IN PHAGWARA AND CELEBRATED KISHORE DA BIRTHDAY WITH GREAT EXCITEMNT AND HAPPINESS WITH KISHORE DA SONGS PLAYING ALL AROUND US. AVTAR A GREAT KISHORE DA FAN WHO OWN A A.C REPAIRING SHOP CELEBRATES KISHORE KUMAR BIRTHDAY EVERY YEAR AND INVITE ALL THE FANS TO HIS SHOP AND THERE ALL THE FANS SHARE THERE VIEWS AND INFORMATION ABOUT KISHORE DA. KISHORE KUMAR is a brand which was there, which is there and which will always be there. Kishore Kumar was a singer in a class of his own. Kishore Kumar is among us through his lively songs of so many moods. Kk was great singer we all know that he sang for all actors but i thing that I don’t understant why KK award went to Manoj Kumar?!!! !because I don’t remember any song sang by KK for Manoj kummar Ji..Raj Kapoor and Manoj Kummar they mostly used Mukesh ji and Shammi Kapoor Ji used only Mohd Rafi..
DEAR ALI,FIRST OF ALL I AM NOT FROM INDIA BUT LET ME TELL YOU THAT YOU ARE RIGHT TO SAY THAT KK AWARD 2009 SHOULD GO SHAMMI KAPOOR. THE SONGS SUNG BY KK IN THE FILMS VIDHAATA AND ARMAAN ESPECIALLY JEEWAN BITANA HEIN DEEWANAPAN COVERS A LOT. LIKE KK OR THE GREAT MHD RAFFI IS AND WILL REMAIN ALWAYS GREAT. ARTISTS ARE NOT POLITICIANS THEY LOVE EACH OTHER. I am also not from India as you said that VIDHAATA song was hit for that Shammi Kapoor should get award please listen to song and understand the bad meaning but when people speak about Shammi Kapoor best songs no one remmber this songs.Shammi Kapoor was only Mohd Rafi fan and when ever Shammi Ji got award he said If there was no Mohd Rafi there was no Shammi Kapoor…. I think when ever there is award they should think thousand time to who award should go and why…..as Bharat ranta award went to great singer Lata Ji but we all know that she was not great human as she is great singer and people like Mohd rafi,SJ,SD Burman,Naushand Ali,Bachchan Ji,Raj Kapoor and many more as I think more greater than Lata Ji(sorry if any one mind)it same as I think for KK award should not go to Manoj Kummar or Raj Kapoor or Shammi Kapoor because there are many other should get Kk award before these as I think. i want to know that which song did kk sing for Raj Kapoor, did kk ever sing a song for Manoj Kumar, Naushad AND Roshan? 1. Songs of Kishore for Raj Kapoor: There are in total 5 songs for Raj Kapoor by Kishore, all from the same film called “Pyar” released in 1950,, music by S D Burman,, Some meorable songs of that film are ” Mohabaat ka chhota sa ek ashiana”, “O bewafa yeh to bata”, ” Kachhi pakki sadkon pe” and “Jalti hai duniya”..
2. 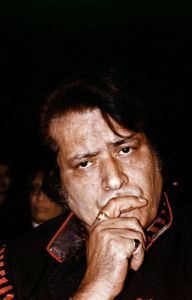 KK never sang a song for Manoj Kumar. I M A HUGE FAN OF KISHORDA .I LOVE HIM & PRAY FOR HIM TO SAY GOD PLEASE SEND HIM . NO ONE BETTER THAN KISHORDA . HE SANG FROM RAJ KAPOOR TO GOVINDA ,ANIL KAPOOR EVEN FOR AADITYA PANCHOLI TOO & SANG UNDER THE MUSIC DIRECTOR FROM KHEMCHAND PRAKASH TO NADEEL SHRAVAN . ALL THE ACTORS WERE TOO MUCH LUCKY TO GET HIS VOICE FOR THEM .HE ALWAYS TRIED TO GAVE A DIFFERENT VOICE FOR DIFFERENET ACTOR EVEN FOR SAME ACTOR IN A DIFFERENT SITUATION. NOBODY CAN DO IT .LISTEN THE SONG TUM BIN JAUN KAHAN ,TUM BIN JAUN KAHAN HIS SONG IS FAR FAR BETTER THAN RAFI’S . RAFI DIDN’T TOUCH THE BOTTOM OF THIS SONG WHAT KISHORDA MADE A EVEREST . RAFI’S VOICE HAD A MOST FLATTER VOICE EVER. u agree or disagree i don’t care but if u r fond of singing u will agree. if listen mukeshji u’ll forget kishor or Rafiji or vis a versa.